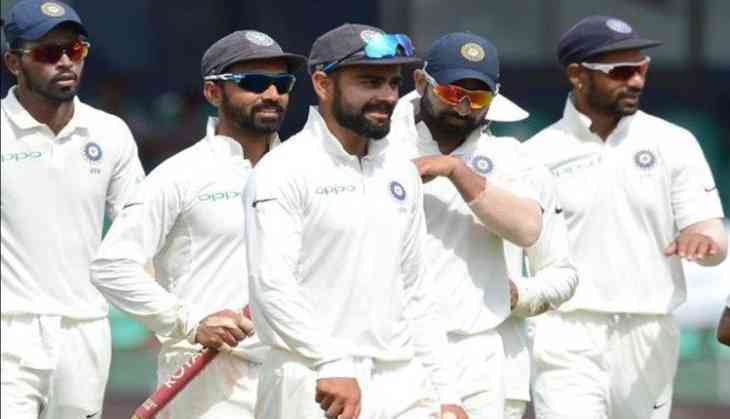 India registers a ruthless win against West Indies on day three of the series opener here on Saturday as Kuldeep Yadav takes maiden five-wicket haul in Test cricket. Windies were forced to follow-on after conceding a 468 run lead and were all out for 196 in their poor show of second innings. Opener Kieran Powell was the only West Indian batsman to make a significant contribution in the second essay, an entertaining 83 off 93 balls with eight boundaries and four sixes. Ashwin was the main contributor in morning and in second session it was Kuldeep's turn to dominate. He used is googly to send back Sunil Ambris, who had no idea how the ball was turning. At lunch, the West Indies were 33 for one in nine overs in their second innings with Ashwin removing skipper Kraigg Brathwaite (10) for his fourth wicket of the day. The West Indies, resuming their first innings at 94 for six, lasted only an hour and 10 minutes, mainly due to efforts of Roston Chase (53) and Keemo Paul (47) who ended up sharing a 73-run stand. Ashwin ran through the tail on a pitch offering plenty of turn, ending the innings with four for 37 in 11 overs as the West Indies were all out in 48 overs. India started with spin-pace combination of Kuldeep and Mohammad Shami. Surprisingly, Chase and Paul had little difficulty in picking the chinaman, who bowled the first over of the day. Paul went on the offensive straightaway, sweeping Kuldeep for two crisp boundaries. Paul was the aggressor in the partnership but Chase also came up with a few attractive shots. Paul was comfortable against Kuldeep but had issues dealing with the short ball. Umesh Yadav set the West Indian up nicely before getting rid of him with a perfectly placed bouncer as he mistimed a pull to be caught at midwicket. Ashwin then removed Chase with a beauty, a flighted ball that turned in viciously to create a big gap between bat and pad before crashing into the stumps, leaving the West Indies at 159 for eight. Number 10 and 11 were easy meat for Ashwin who sent them back with the away turning ball.